Our daughter had a great first year at Beaver! She has celiac disease, and we were concerned about lunches and snacks being provided. The staff did a wonderful job, providing her with delicious hot gluten-free lunches on campus and with gluten-free sandwiches and snacks on field trips. Thank you! Toss off your chef hat and take the summer off from preparing your kid’s lunch. To make life a whole lot easier on you, morning snacks and daily lunches are included in your child’s Beaver experience. We’re talking all the healthy, well-balanced favorites he or she loves including chicken tenders, turkey tacos, fresh fruit, tossed salad and our weekly Friday barbeques. Or, they can choose daily from a variety of deli sandwiches and bagels. Lunch is served in our dining room for Lower and Middle Campers and outside at picnic tables on the terrace for Upper, Senior and Specialty Campers. Our Group Counselors serve the meals and dine with campers, providing a relaxed, fun setting where the conversation and jokes flow freely. Click here to view and download a pdf of our menu. 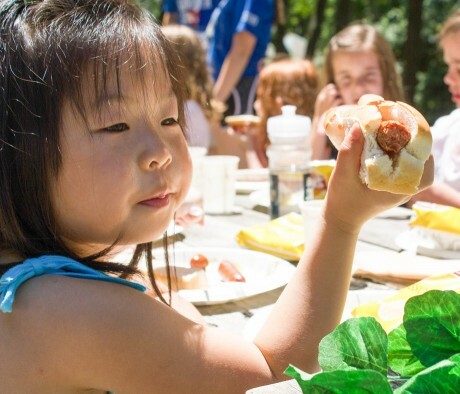 Food allergies are a fact of life for many of our campers and we take that very seriously. Beaver is NUT SAFE. There are no peanuts or tree nuts served and there are no hidden nut products found in any of our foods. We exclude all pre-packaged snacks that are “produced in a facility that process peanuts and tree nuts,” according to their ingredient labels. We offer Gluten-free lunch and snack alternatives each day. We do not allow camp families to send in any outside food for birthdays or special occasions. Our food service staff is trained and certified in ServSafe and allergy management in the kitchen. Our camp staff receives extensive food allergy training and closely supervises all meals with their campers. We maintain a central listing of all foods served by the camp and their detailed ingredient lists in the Camp Office for parents to look through before camp. 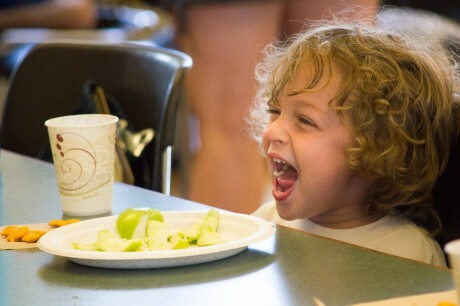 If you have a food-related question or concern, please contact us prior to the start of camp season, so we can meet with you in person to discuss how we can best accommodate your child’s needs.